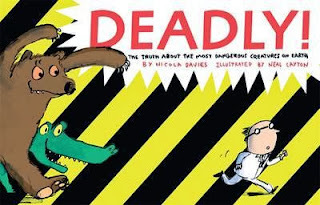 Masterful information-hound and animal-lover, Nicola Davies, spills her Zoologist credentials in this fabulously fun book about the deadliest creatures on earth. This high-text picture book is a clever amalgamation of information book and comic book, with vibrantly kooky illustrations, speech bubbles, dynamic typeface and plenty of gory fact (the bloody endpapers are clear warning). This is not a book for sensitive wee souls. Kids with a particular penchant for 'realistic' nature (yes, animals eat other animals, including us) will love it, even kids younger than 8. Given the quite graphic content (albeit in cartoon form), I would, however, recommend this for kids aged 8 or up (or at least with parental guidance). The content is done openly but with sensitivity, and at times with a splotch of humour. I mean, even I had to smile when I discovered a type of ant--the carpenter ant--who essentially suicide bombs other insects to effect a kill. Animals covered include, of course, the big cats, airborne predators, spiders and other insects, sharks, whales and other sea creatures, crocodiles, dogs (did you know they can far outrun cats and have a far more lethal bite than even the biggest of cats, who soon run out of puff? ), snakes, bears and more. I, for one, am glad I read this book (even if it gives me recurrent nightmares) because I did NOT know that the world's deadliest spider is the Brazilian wandering spider, who particularly loves to hide in shoes. As the author says: "What could possibly go wrong?" This book is great fun, well-produced, fully-informative and terrifying. Proceed with caution. Footnote ('scuse the pun): I'm switching to flipflops and cancelling my air ticket to Brazil.